and Fort Rucker Army Aviation Center. Description: I WAS DRIVING WITH MY BOYFRIEND AND HIS 8 YEAR OLD SON OFF OF HWY 431 (AROUND MIDLAND CITY ALABAMA) WHEN WE NOTICED A LARGE ROUND OBJECT HOVERING OFF IN THE DISTANCE. IT HAD A LOT OF WHITE LIGHTS ALL AROUND IT AND A FEW RED ONES. WE WERE ABOUT THIRTY FEET AWAY AND IT WAS HOVERING ABOUT FIFTEEN FEET IN THE SKY. I PASSED IT AND PUT THE CAR IN REVERSE. AS I BACKED UP IT MOVED IN THE SAME DIRECTION AS I DID AND DARTED INTO THE SKY AND DISAPPEARED. I AM TOTALLY SHOCKED AND MY BOYFRIEND IS TERRIFIED. I AM CONVINCED. Note: Who knows what the witnesses saw? I have no explanation. 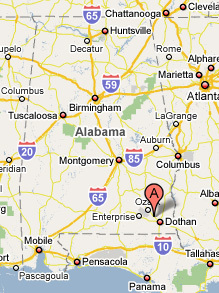 This entry was posted in 2009, Formation of Lights, Orb-like craft, UFO sightings Alabama. Bookmark the permalink. Numerous people in Midland City Alabama have seen some kind of lights hovering in the skies at night. The lights flickered and some of them changed color periodically. They are white, red, blue and green. This has been ongoing for several years. A few months ago, my husband and I witnessed one of these hovering and then it suddenly started dating around and then hovered again. No one has ever stayed out long enough to see what happens to them. By morning, they are gone. Several people tried using binoculars, but they really didn’t help. I sure wish someone would investigate this. I’m thinking maybe that they could be drones., but who knows?